Although Da Vinci’s Last Supper is perhaps the most famous fresco that was nearly destroyed during World War II, the people of the Italian town Sansepolcro in Tuscany contend that they, in fact, hold the most important work spared in the war. For this, they can thank commanding British artillery officer and great appreciator of art, Tony Clarke, who was supposed to raze the city, but defied orders—having read Aldous Huxley’s comment that Sansepolcro was home to the best painting in the world. 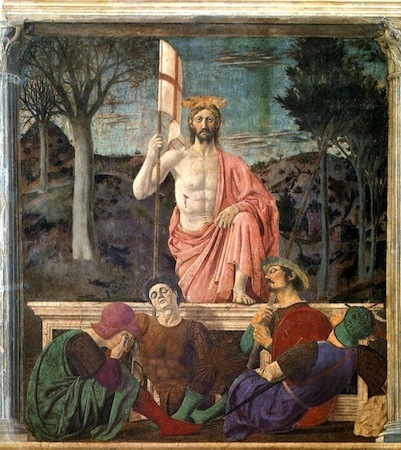 Huxley, of course, was referring to Piero della Francesca’s famed fresco, The Resurrection. Piero painted this fresco around 1463 in the civic hall of Sansepolcro, which had been occupied by the Florentines but was recently returned (the Italian city-states were often at war). The subject matter then—the triumphant Christ arising from his tomb the third day after his death—may be a reference to the triumph of the town itself, which was named after the Holy Sepulcher (Sansepolcro in Italian, and the Holy Sepulcher is the tomb that Christ was buried in). The presence of the large stone in the lower right hand corner of the fresco supports this, as it possibly represents the relic of the sepulcher (the burial place, in this case of Christ) putatively brought to Sansepolcro by the saints who founded the town, Arcano and Egidio. 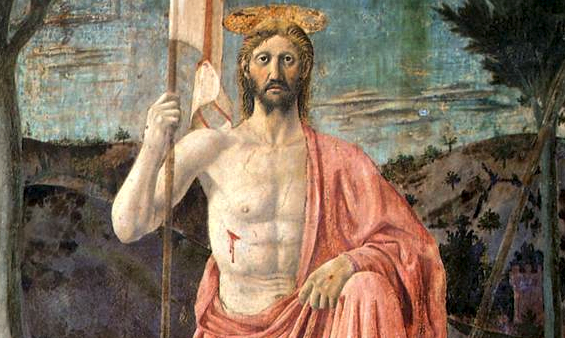 Unlike other paintings by Piero (The Flagellation for example), The Resurrection is less interesting iconologically than it is formally; that is, art historians are less concerned about what it might mean than what it actually looks like. Although The Resurrection is often depicted by having Christ emerge from a cave from which a boulder has been “rolled away,” Piero instead chose to show Jesus stepping out of a Roman sarcophagus. 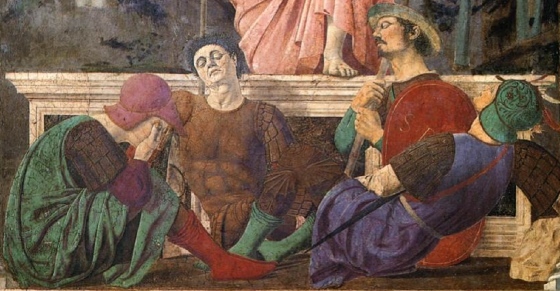 In the foreground of the painting, the Roman soldiers ordered to guard the tomb have all fallen asleep. The position of their bodies is quite interesting. The reclining soldier certainly could never actually maintain that pose while sleeping in real life, and his comrade next to him, holding the lance, doesn’t even have legs. These two details show that Piero was more concerned about achieving a pleasing composition than being true to life. Also noteworthy is that, although we know that Piero was the author of a major treatise on perspective and was also a mathematician and geometer, the painting contains two vanishing points (the point at which all the lines of the painting should converge). On one hand, we see the faces of the soldiers from below, but on the other hand, the face of Christ is painted straight on. If the perspective were consistent throughout the painting, we would see all the faces from the same vantage point. Again, Piero has sacrificed realism for effect. Perhaps the most striking feature of Piero’s fresco is the physical reality of the people he paints. Piero has been lauded as one of the first painters of the Renaissance to capture realistic faces that show emotion. In fact, Giorgio Vasari, the great sixteenth-century art historian and painter, reported that the face of the soldier in brown armor was a self-portrait of Piero. Although there is no way of knowing if this is true—and Vasari is known for not always being accurate—his inclusion of this detail underscores the fact that Piero’s human figures are not just made-up “types,” but contain a spark of individuality that makes them feel like they are based on observations from real life. This is one of the major differences between Renaissance and Medieval art, and is partly why Piero is considered one of the great early Renaissance painters. Piero has organized the figures so that an isosceles triangle is formed from the top of Christ’s head, through the soldiers, to the lower corners of the paintings. In addition, a tree is placed almost-symmetrically on either side of Jesus. This emphasis on geometric order and harmony is typical of the Renaissance, as best exemplified by paintings such as Raphael’s School of Athens, and Leonardo’s Last Supper. Also characteristic of Piero’s work is the mass of the bodies, an effect achieved in a variety of ways. Perhaps the most obvious is the stalwart pose of Christ, who appears anchored to the tomb by both his left leg and the flag in his right hand. At the same time, he seems to actively be using the flagpole and the hand on his knee to raise his other leg out of the tomb. The flexed muscles of his abdomen also emphasize the reality of Christ’s body, which is physically engaged despite the serenity of his face. The complex positioning of the soldiers’ bodies also adds to this feeling of mass. Piero overlaps the men, intertwining their feet, so that they appear to exist in real space. The abdomen of the soldier in brown also echoes that of Christ, lending him an even greater sense of realism. 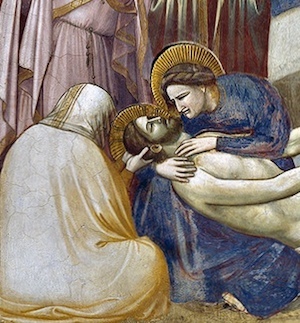 The soldier all the way to the left, whose body is curled almost into a ball and whose face is hidden, is reminiscent of a similar figure in Giotto’s Lamentation, who is also used at the corner of the painting to anchor the eye and add weight to the composition. Not many of Piero’s paintings have survived, and those that have are scattered around the globe; few are in major museums. However, it is certainly worth the train ride from Florence to see this gem of the early Renaissance. And when you do, be sure to remember to thank Tony Clarke, without whom this painting would have become a pile of dust. 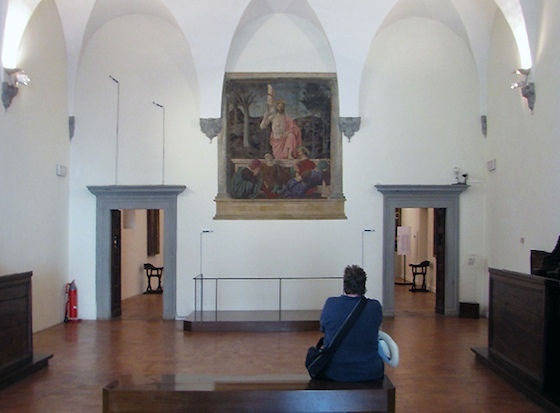 James Elkins, “Piero della Francesca and the Renaissance Proof of Perspective,” The Art Bulletin, Vol. 69, No. 2 (June, 1987) , pages. p. 220-230. Cite this page as: Christine Zappella, "Piero della Francesca, Resurrection," in Smarthistory, August 9, 2015, accessed April 20, 2019, https://smarthistory.org/piero-della-francesca-resurrection/.